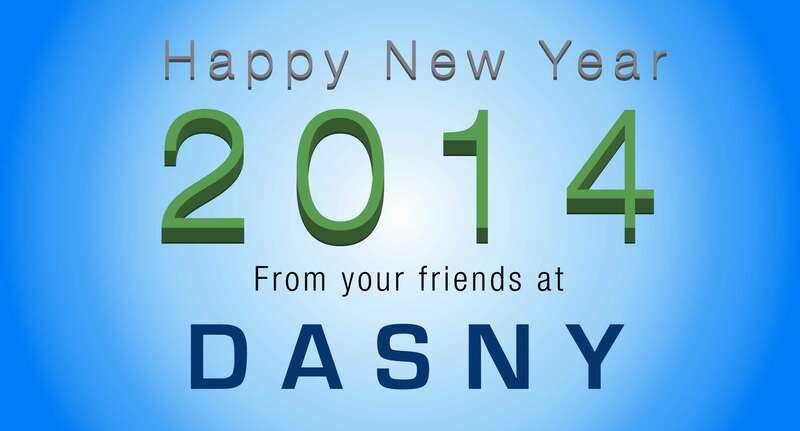 We start 2014 with many exciting events on DASNY’s horizon. On April 5th, DASNY will be celebrating its 70th Anniversary. Since its inception in 1944, DASNY has served well the citizens of our great state. Because of the diversity of services we provide, many ask “why are you called The Dormitory Authority.” The Dormitory Authority was established by a law signed by New York Governor Thomas Dewey on April 5, 1944. At first, our only purpose was to finance and construct dormitories at 11 State Teachers' Colleges in New York. Through the years, however, DASNY has financed $105.3 billion worth of critical social infrastructure for public and private colleges and universities, hospitals and nursing homes, libraries, social service agencies and school districts. We have managed the construction of thousands of projects from simple renovations to the most complex research facilities and laboratories. These projects will serve future generations of New Yorkers and will continue to attract new people to our state. Because we do so much more than build dorms, we refer to ourselves as DASNY. DASNY is New York State’s facilities finance and construction authority. We finance, build and deliver. What can we do for you? Last fall, DASNY proved itself in action. Working with the New York Rising Community Reconstruction Program, DASNY demonstrated hands down that it is a flexible, responsive, reliable, professional organization that delivers! The Housing Trust Fund Corporation (HTFC) enlisted DASNY to complete more than 5,000 home inspections in six weeks! DASNY utilized a team of three firms: the LiRo Group, McKissack & McKissack, and the URS Corporation; hundreds of staff and inspectors from 18 states; and multiple subcontractors all managed by DASNY. At the culmination of these efforts in mid-October, letters were sent to those who sought help from the NY Rising program informing them of their projected award. Nearly 4,000 homeowners on Long Island alone will receive on average more than $110,000 each. NY Rising was established by Governor Cuomo to provide vital assistance to communities, businesses and homeowners whose properties were severely damaged by hurricanes Sandy and Irene, and Tropical Storm Lee. The U.S. Department of Housing and Urban Development (HUD) awarded $1.7 billion to New York State to provide relief to property owners affected by these devastating storms. In the current fiscal year, DASNY’s third quarter MWBE utilization rate reached 29.71 percent -- the highest in our history. 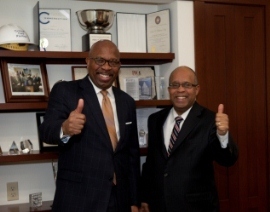 This accomplishment would not have been possible absent the leadership of our President, Paul T. Williams, Jr. and Director of Opportunity Programs, Michael M. Clay, who heads a dedicated team of professionals in DASNY’s Opportunities Programs. We are proud of their accomplishments and applaud a job well done! Much of our success is a direct result of Governor Andrew M. Cuomo’s commitment to this issue. From the moment he took office in 2011, he made MWBE participation a mandate and priority in New York State. Since then, there has been a cultural shift in how executive agencies, public authorities and the prime bidding community understand and support MWBEs, ultimately providing them with greater opportunities to participate and grow their businesses in our communities. DASNY continues to be a leader in MWBE programs and initiatives while working rigorously to find new ways to educate MWBEs and to bring together prime contractors and subcontractors. This synergy is the heart of what makes our MWBE programs work. 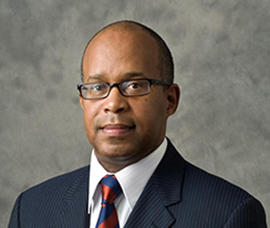 Mr. Clay meets regularly with State agencies, engaging in productive dialogue about the needs of the MWBE community, the lessons we’ve learned at DASNY and the issues we’ve yet to overcome. Through these meetings, we share our best practices and discuss how we can be more efficient and successful in utilizing MWBEs with each new contract opportunity. With the implementation of the New York State Contract System, the MWBE certification process has become faster and more user-friendly. This online system allows for a centralized MWBE Directory, contract compliance, verification and monitoring, and we expect that it will continue to drive MWBE utilization rates even higher. The system creates a uniform platform for MWBE compliance reporting statewide. Now, more than ever, MWBE firms can see the importance of obtaining certification which provides them with numerous opportunities to grow their businesses. We look forward to continuing to create innovative ways to support MWBEs and to assisting our clients and colleagues meet and exceed their MWBE goals. In a 1999 landmark ruling (Olmstead v. L.C. (98-536) 527 U.S. 581 (1999)), the U.S. Supreme Court held that unnecessary institutionalization of individuals with disabilities violates the Americans with Disabilities Act (ADA). The court found that individuals should receive services and support in the most integrated setting appropriate to their needs. To meet this obligation, the NYS Office for People with Developmental Disabilities (OPWDD) was tasked to transition eligible individuals with developmental disabilities to integrated community settings. Governor Andrew M. Cuomo further supported this obligation by requiring the transition of individuals residing in developmental centers to community-based settings by 2014. As part of this commitment, in 2010, OPWDD asked DASNY to find solutions to accomplish this ambitious endeavor. The initial phase involved the siting of new community-based residential facilities, housing approximately 80 residents, to be relocated from a centralized DDSO facility. Right away, the team realized that winter construction would be required to meet the schedule. 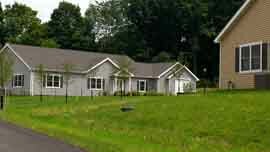 Modular construction became the most practical option. To enhance efficiencies and reduce schedule time, the team included the use of a panelized foundation wall system that only requires two days per home to install. The result is a health care facility that resembles a home in every way but provides an unmatched level of safety, care, and flexibility for its residents. The Healthcare Modular Program design began with the coordination and development of a uniform floor plan that could be utilized at various locations throughout the State. With input from various facilities, an eight-bed home was determined to be the most practical and economical. After numerous site search evaluations, six locations accommodating eight modular homes each were selected for development. 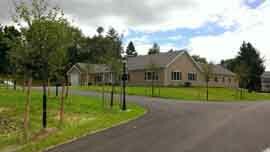 DASNY is proud to report that all of these homes are now complete in Sidney, Oxford, Penfield, Brighton, Endicott and Union, New York. These homes reinforce OPWDD’s and DASNY’s commitment to providing New York State’s most vulnerable individuals with the highest quality of support and service. 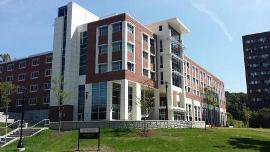 With enough space for 231 students, the new residence hall came in on budget ($23.3 million) and on time. 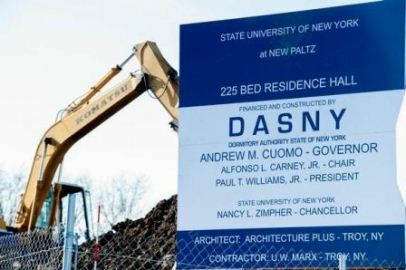 In December, DASNY President Paul T. Williams, Jr. spoke at the groundbreaking for a new $30.5 million, 225-bed residence hall on the SUNY New Paltz campus. This is the latest addition to the South Complex and is intended to help relieve the current shortage of beds on campus. Construction will be completed in the summer of 2015, ready for student occupancy for fall semester 2015. The LEED goal of the new building is Silver. The American Institute of Architects (AIA) of New York State recently launched the Excelsior Awards Program for Public Architecture. This new program celebrates design and professional excellence in publicly-funded architecture in New York State. DASNY is pleased to have joined with the other state entities and AIA New York State in developing the Excelsior Awards Program. Qualifying firms are encouraged to submit projects for award consideration by February 7, 2014. More details regarding the program requirements and submission schedule are included in the attached brochure and are also available on the Excelsior Awards Program’s website. DASNY is now offering college and university students an exciting internship for academic credit. The new internship program provides hands-on experience in a professional setting and engages students with DASNY staff and industry leaders. Gain invaluable experience in a supportive setting. Check DASNY’s website soon for more details on these procurement opportunities.